We are excitedly anticipating the arrival of our friends, Brian and Rynessha! This will be the first time we’ve had friends overnight at the farm. You may remember my post back in November about our couples’ trip to Des Moines? Well since then, Rynessha and Brian have gotten engaged! We cannot wait to see them and celebrate with a long weekend full of small town adventure. 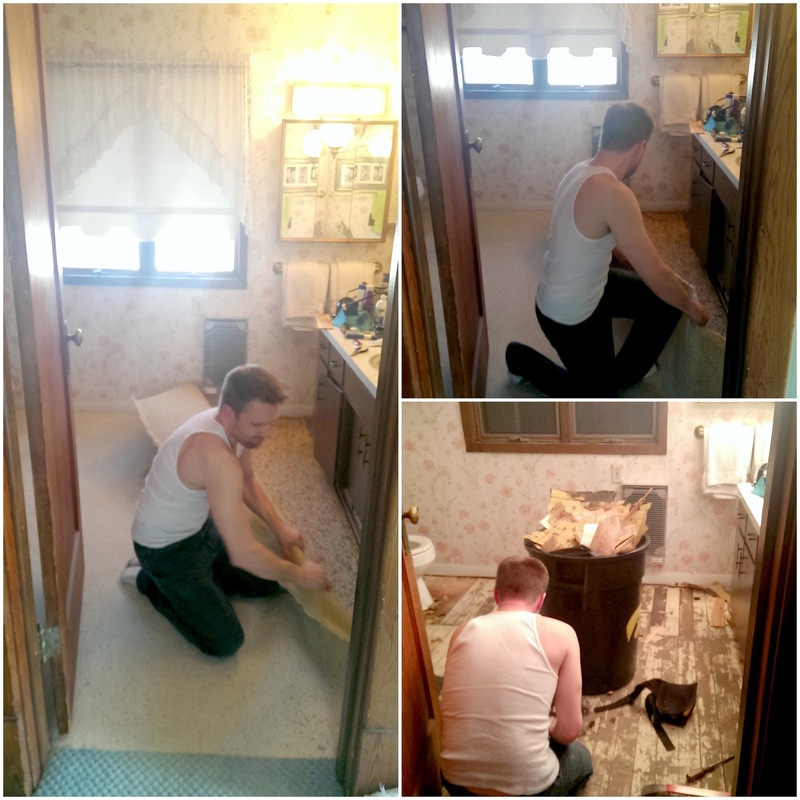 In preparation for their arrival, Zach and I decided to tackle a minor bathroom update over the weekend. What started this little endeavor was Zach’s decision to pull up the carpet in the bathroom. With a tiny bit of apprehension (but of course encouragement) I went downstairs to cook dinner while Zach ripped up the carpet from the bathroom. Under the carpet was a layer of wood painted linoleum. Under the linoleum was a layer of 1969 newspaper. 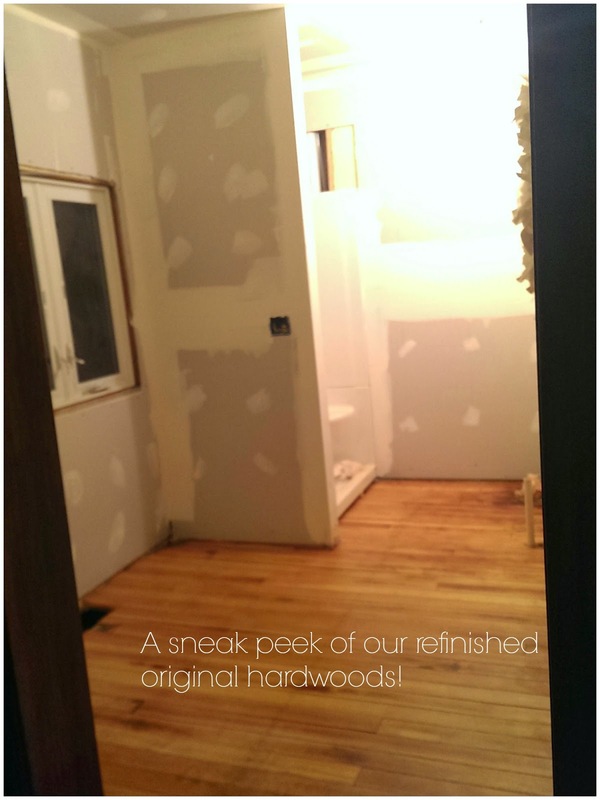 Under the 1969 newspaper were a few patches of other various “linoleum” patterns and finally…the original (yet painted and glued) hardwoods. 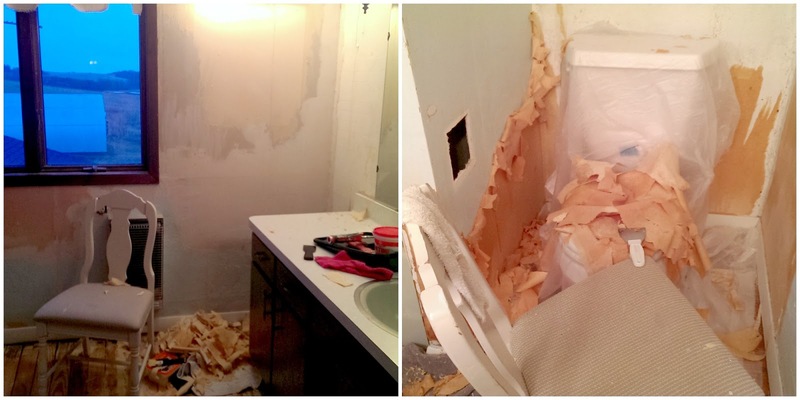 With the downstairs laundry room and bath under construction, our only functioning bathroom in the house was a complete disaster zone. Panic almost crept in. With plans to rent a floor sander to refinish the downstairs bath/laundry hardwood flooring, we only hoped it would easily clean up the upstairs main bathroom floor too. On Sunday morning after church, Zach headed to the hardware store to rent the floor sander and edger. As if removing the flooring wasn’t enough, I decided to begin removing the pink floral wallpaper while Zach was out renting the sander. Between Sunday and Monday, Zach sanded both projects. I stayed up all night Monday and late Tuesday, removing wallpaper, painting the upstairs bathroom floor, brushing on the protective finish to the bathroom upstairs and our laundry/bath downstairs. I even snuck over to our friends’ house to do a quick load of laundry yesterday. (Did I mention we haven’t had our washing machine for a week and a half?) Exhausted was an understatement. Nonetheless, coming home to the once glue-covered carpeted laundry room floor transformed back into the original rustic hardwoods was unbelievably rewarding. It gave me a second wind and I headed back upstairs to begin taping off the bathroom for priming. When Zach got home from work he helped me finish up priming the multi-textured never-ending bathroom walls. This morning as our awesome neighbor and architect extraordinaire applied the last coat of mud to our freshly sheet rocked laundry room. I had some extensive cleaning up to do and made a few last minute touch ups to my bathroom floor paint job. 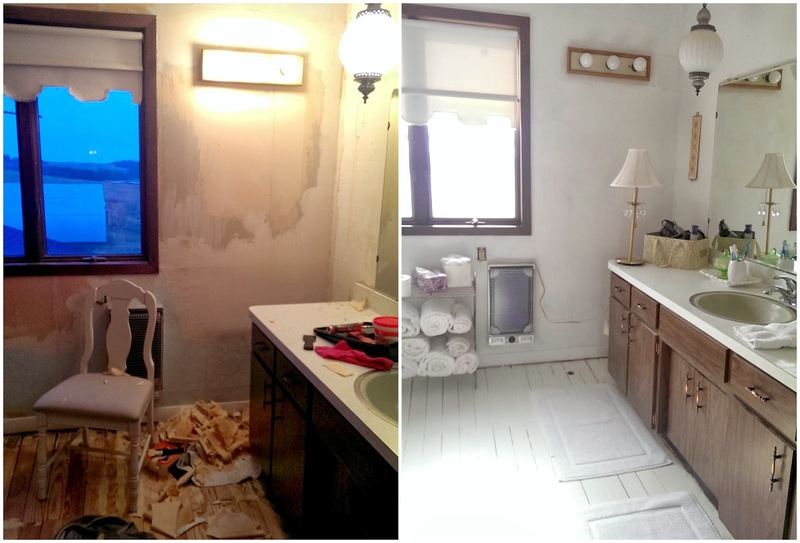 While there is still much to do in our bathroom, it feels nice to have the major work done. Maybe Rynessha and I will find a good paint color while she is here! I may need to catch a quick nap before our guests arrive! I'll admit, it was a little crazy to start such a big project three days before having overnight company. Then again, panic can spark intense motivation. I will say, it’s been so interesting to uncover Grandma Berniece’s style layers and realizing how similar we are. I can totally understand why she chose to do things like popcorn her walls, use wallpaper to hide cracks in the plaster, and cover up one layer of flooring with the next. The funniest discovery occurred in the wee hours of the morning as I finished removing the wallpaper. 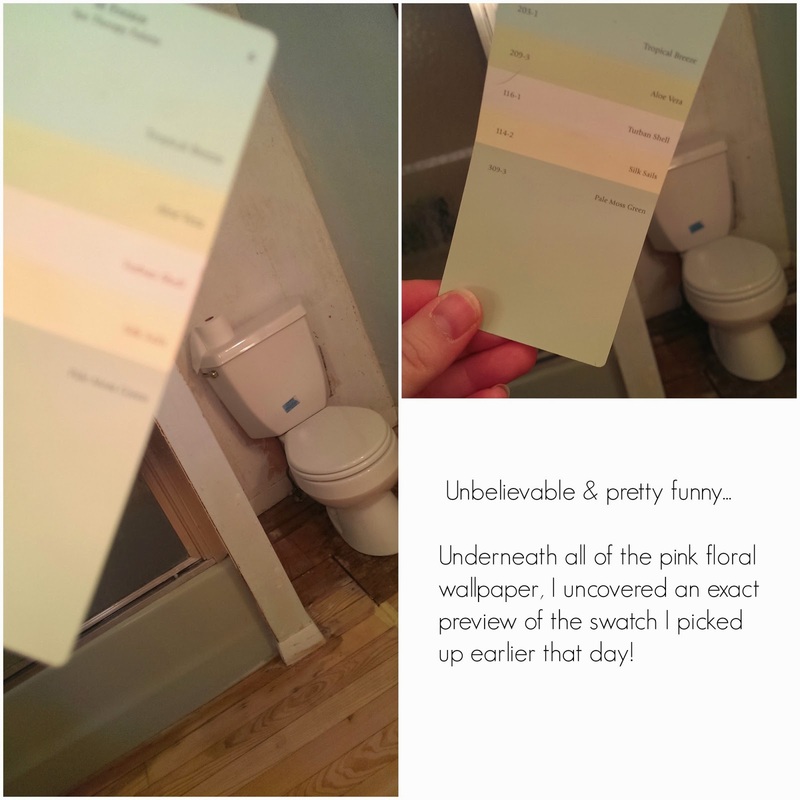 I looked around to see each and every color from the swatch I had brought home from the hardware store. I had to pause and giggle a little. In my state of exhausted delirium, I imagined Grandma Berniece laughing with me. Both the wallpaper and carpet removal made me feel more inherently connected to Don and Berniece. Uncovering the phases of their lifetime, noticing the similarities in our style, and understanding the thought process behind some of their choices…a sense of life’s cyclical inevitability washed over me. We are all so different, and the same. Stay tuned for our laundry/bathroom debut!! Krista's North Carolina Senior Portraits!